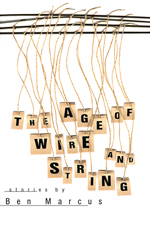 In The Age of Wire and String, hailed by Robert Coover as “the most audacious literary debut in decades,” Ben Marcus welds together a new reality from the scrapheap of the past. Dogs, birds, horses, automobiles, and the weather are some of the recycled elements in Marcus’s first collection — part fiction, part handbook– as familiar objects take on markedly unfamiliar meanings. Gradually, this makeshift world, in its defiance of the laws of physics and language, finds a foundation in its own implausibility, as Marcus produces new feelings and sensations — both comic and disturbing — in the definitive guide to an unpredictable yet exhilarating plane of existence.